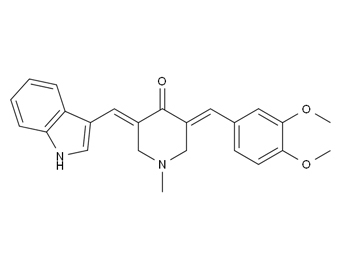 Silibinin, an effective anti-cancer and chemopreventive agent, has been shown to exert multiple effects on cancer cells, including inhibition of both cell proliferation and migration. 5-Aminolevulinic acid methyl ester hydrochloride is a topical cream formulation containing the hydrochloride salt of methyl-5-aminolevulinate, a lipophilic methyl ester of 5-aminolevulinic acid, with photosensitizer prodrug activity. Chlorpromazine is in the typical antipsychotic class. Isosorbide is used as a diuretic used mainly to treat hydrocephalus and is also used to treat glaucoma. Trimetazidine is a vasodilator used in angina of effort or ischemic heart disease. Sofalcone is an oral gastroprotective, gastrointestinal medication. It is a synthetic analog of sophoradin. 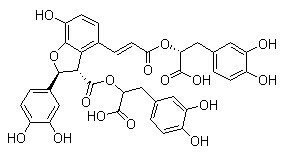 Salvianolic acid B is an active ingredient of Salvia miltiorrhiza, which has been widely applied in China for the management of various microcirculation-related disorders, such as cardiovascular disease, cerebrovascular disease, and diabetic vascular complication.